in an old Beijing hutong inn? 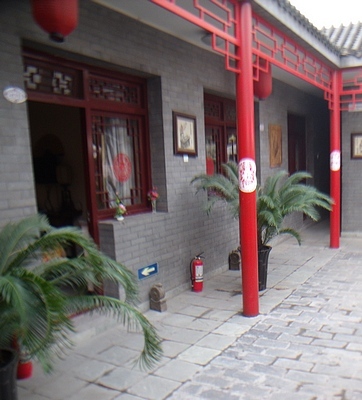 Inside this hutong courtyard, looking toward the southwest corner we see several rooms, each of which opens onto the central area. The hotel has decorated the courtyard nicely with artwork, drying garlic, and red papercuts in the windows. 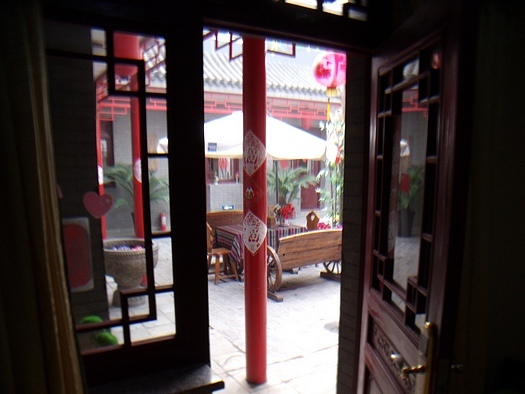 The small, black opening you see behind the right-hand pole is the entrance to this Beijing hutong inn courtyard - just a regular-sized doorway. Looking from inside the room we occupied, this is the view of the courtyard. In the courtyard are a couple of tables with sun umbrellas, all very bright and cheery. 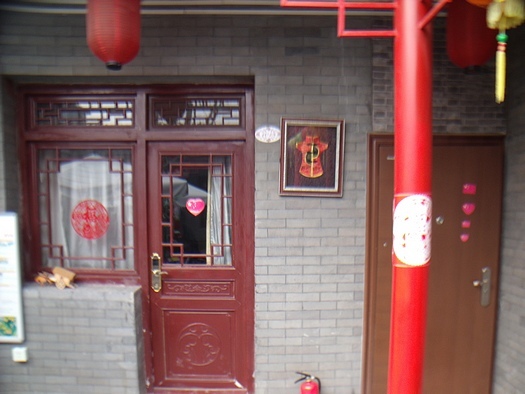 These are the two white dots you saw on the previous page's Google map showing the location of this hutong. You might object that cafe tables and sun umbrellas don't match the idea of an old Beijing hutong inn, but one main purpose of a hutong central courtyard has always been to have a protected yet sunny area for drying things and staying warm or cool outside the rooms. Why wouldn't it have some sort of shade for the stifling Beijing summers? Anyway, what you see here beats what I saw in another hutong hotel in this neighbourhood - it had a "Tiki Bar" in the courtyard! This is the door to the room we had. The floor was stone but even in November the wall air-conditioner/heater kept the place warm. The decorations and furniture were modern but made in an old style. The room had its own small bathroom with shower. That's definitely not hutong tradition, but I'm not complaining. Here's the inside of one of the rooms, in this case a single room. Here the bed is made to look like a traditional Chinese "kang". That's a sleeping platform made of bricks. You heat it up with a fire underneath or with hot air running through flues from a fire nearby. A real kang could take hours to heat, but then would retain its heat throughout the night with the fire out. If you like a firm bed, you'll love a kang. Actually, most of the Chinese beds I've slept on have been hard, though not quite as rock-like as a kang. 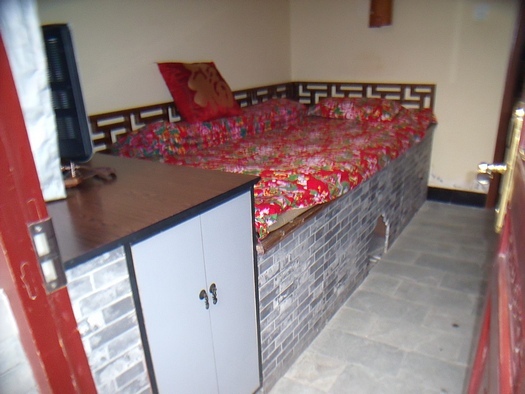 One authentic thing about this room is the size of the bed; in a traditional Bejing hutong inn, the kang would take up at least a third and perhaps up to half of the room. My wife and I were really impressed with the Citycourt Hotel. We got a really good rate (about US$50 - that's good for a tourist hotel in Beijing) because it was the November off-season but what we really liked was the comfort of modern convenience in an old hutong setting. It was walking distance to the Bell Tower and Drum Tower, and even at night we felt safe wandering through the neighbourhood filled with little restaurants and friendly people. 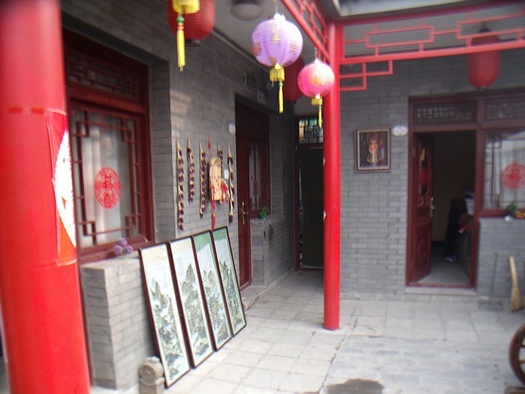 If you want to experience a traditional(-ish) Beijing hutong inn, we recommend this one. Go to previous page about this hutong hotel. Return from Beijing hutong inn to Chinese Places page.